Orange, Watercress and Endive Salad with Asian Orange Vinaigrette - A recipe from Savor California, the online showcase for extraordinary gourmet foods and beverages from California. Recipe adapted from John Ash. Add the first 5 ingrediants to a blender and blend until smooth. Add oils and pulse 2 or 3 times to turn a light emulsion. Whisk in onions and cilantro and season to your taste with salt and pepper. 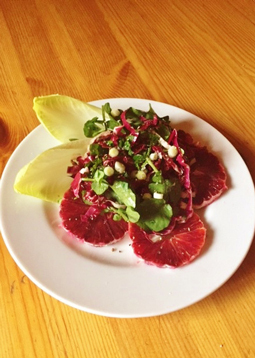 Arrange endive, oranges, and watercress attractively on chilled plates. Toss the radicchio with a couple of tablespoons of the vinaigrette and mound in the center. Drizzle additional vinaigrette over the rest of the salad. Note: You may not use all the vinaigrette but it will keep up to 5 days covered in the refrigerator and makes an excellent marinade for grilled fish, chicken, or pork.